Get swept away in Erin A. Craig's mesmerizing House of Salt and Sorrows. As one by one her beautiful sisters mysteriously die on their isolated island estate, Annaleigh must unravel the curse that haunts her family. Be careful who you dance with. . . . In a manor by the sea, twelve sisters are cursed. Annaleigh lives a sheltered life at Highmoor with her sisters and their father and stepmother. Once there were twelve, but loneliness fills the grand halls now that four of the girls' lives have been cut short. Each death was more tragic than the last--the plague, a plummeting fall, a drowning, a slippery plunge--and there are whispers throughout the surrounding villages that the family is cursed by the gods. Disturbed by a series of ghostly visions, Annaleigh becomes increasingly suspicious that her sister's deaths were no accidents. The girls have been sneaking out every night to attend glittering balls, dancing until dawn in silk gowns and shimmering slippers, and Annaleigh isn't sure whether to try to stop them or to join their forbidden trysts. Because who--or what--are they really dancing with? When Annaleigh's involvement with a mysterious stranger who has secrets of his own intensifies, it's a race to unravel the darkness that has fallen over her family--before it claims her next. 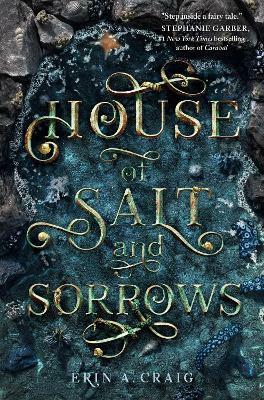 House of Salt and Sorrows is a spellbinding novel filled with magic and the rustle of gossamer skirts down long, dark hallways. Get ready to be swept away.